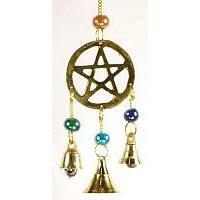 A stunning 32 inch long wind chime made up of brass pentacles decorated withe brass chains, beads and bells; all strung together with brass chain. 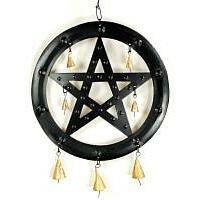 Comes with a large brass ring at the top for hanging. 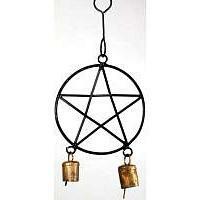 About this page: A stunning 32 inch long wind chime made up of brass pentacles decorated withe brass chains, beads and bells; all strung together with brass chain.